19th century Germany was dominated by coal and steel production, claiming farms and paddocks in its progress. As the Industrialisation moved northwards from the Ruhr area, the landscape changed radically from a bucolic idyll to an industrial existence. As the last remaining working farm from that era, Ingenhammshof, managed to survive by becoming a food stuff provider to the iron works, and now instructs in the principles of ecological farming! 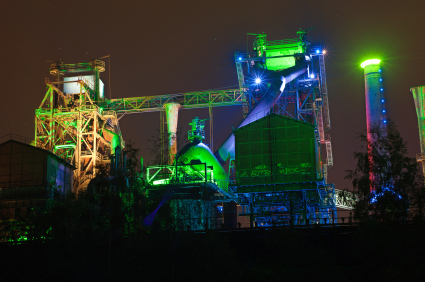 The idea of a park on the site of an old coal and steel production plant was conceived in 1991. A citizen’s initiative against the plain destruction of the site kick-started a rethinking process that would result in a park remembering the Old and incorporating the New. Out of five design teams, Latz+Partner won the competition. Their design aimed to keep all the original structures and re-purpose them: some were used to store the highly contaminated soils, converting the sewage system to a cleansing system for the site and housing a variety of cultural and sport activities in other buildings. Within the main complex, Latz emphasized specific programmatic elements: the concrete bunkers create a space for a series of intimate gardens, old gas tanks have become pools for scuba divers, concrete walls are used by rock climbers, and one of the most central places of the factory, the middle of the former steel mill, has been made into a piazza. You can find more information and pictures on this web site. It is an amazing experience to be able to walk through this park of rust and steel on our Rhine and Romans Tour without the need for a hard hat, unless you intend to go rock climbing of course. The sheer size of the structures combined with the range of modern day activities makes for a unique experience only to be surpassed by the light show in the evening! As the main concern behind this park is the creation of memories, we hope yours will be truly memorable. The museum we visit on our Rhine and Romans Tour is named after its founding director Helene Kröller-Müller who lived from 1869 to 1939. With the money made by her husband and the help of her advisor, H.P.Bremmer, she had collected almost 11,500 art objects. She always had surrounded herself with the art and wanted to create a museum with an attached residence. Over the years there had been various designs and building attempts, which culminated in her presenting her collection to the State in 1935, under the condition that an appropriate museum to house the collection was going to be built. The collection was finally being displayed in the Rijksmuseum in 1938, with her as its first director. 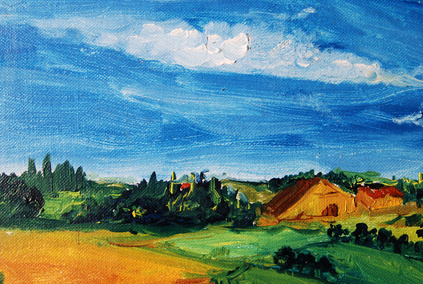 As Van Gogh was her personal favourite, she acquired a large number of paintings and drawings by him. But she also admired other modern artists. Picasso, Juan Gris and Mondriaan, whose works can be admired alongside Van Gogh’s pieces. The museum not only has an impressive collection of paintings, but also can claim to have one of the largest sculpture gardens in Europe. The garden reflects Helene Kröller-Müller’s conception of a symbiosis between art, architecture and nature. The collection includes works by Auguste Rodin, Henry Moore, Jean Dubuffet, Mark di Suvero, Claes Oldenburg, Fritz Wotruba, Joep van Lieshout and many more. More detailed information regarding the family and museum history can be found here. One advantage, or disadvantage one might say, of having been at the centre of attention over the centuries, is the abundance of culture to be explored in Cologne. Every aspect of life throughout the history of Cologne has a museum to explain and showcase it to the interested visitor. To give you an idea, they (somebody with a bit of foresight in Cologne) have put up a web site exclusively dedicated to museums in Cologne! And if that doesn’t give you sore feet there’s the city’s web site with gazillion more things to do. Including shopping! Whether you’re interested in the Roman history, the Catholic and Christian influence throughout the centuries, the history of Eau de Cologne or the history of carnival, there’s a museum for it! And as for architecture? Apart from the famous Cologne Cathedral, there’s an abundance of churches, medieval houses, city gates, bridges but also many modern buildings to view, like the Hercules Building on the picture. During our guided city tour with a knowledgable local on our Rhine and Romans Tour we will get an insight into this fascinating ancient modern city. The truly spectacular and world famous Cathedral was conceived in the 13th century as a grand structure to accommodate the reliquary of the Three Kings and as a place of worship for the Holy Roman Emperor. After “just” over 200 years work on it ceased, to be recommenced in the 19th century and in 1880 construction, according to the original plans, was finished. Well, sort of: according to local legends, the architect made a pact with the Devil to have the plans, which would bring him fame and fortune, in exchange for his soul. Not keen on losing his soul, his housekeeper and the local bishop thought of a way to trick the Devil and still get the plans. The architect took a holy relic, one of the bones of one of Eleven Thousand Virgins, and a cross to protect him and brandished them in front of him when confronting the Devil. And it worked, to a degree. Even though the Devil still killed the architect, the cathedral didn’t get finished and we don’t know the name of the architect. Now, you might say, BUT it did get finished. It all depends on your definition of “finished”. To this day work is being done on the cathedral, all year, for maintenance and repair. During the centuries long construction a range of stones from the surrounding areas were used, and they all have proven too fragile and thus need frequent replacing. Nonetheless, it is an amazing building and you should not miss the opportunity to view it thoroughly, from the outside and inside, on a guided tour as part of our Rhine and Romans Tour. Let your imagination be inspired by the hundreds of thousands of people involved in its creation and maintenance. 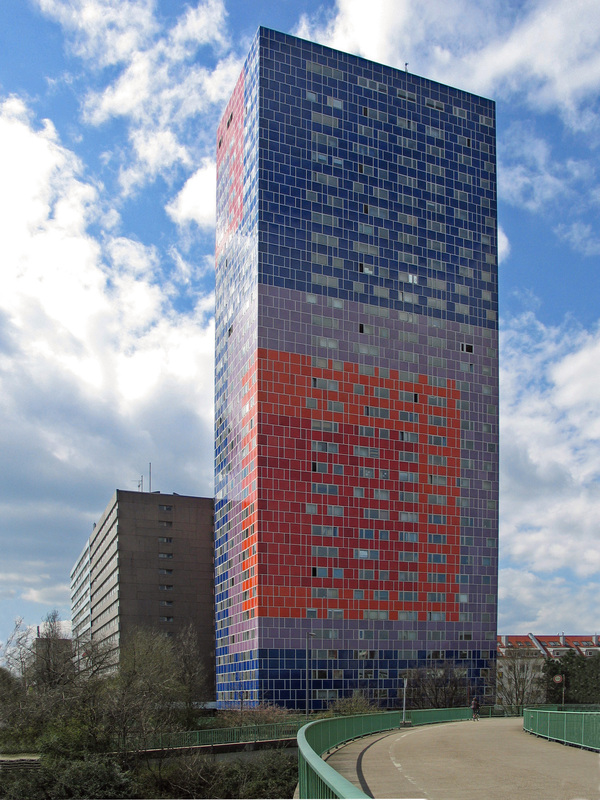 On a personal note, I was born in Cologne, and this building, even when viewed through images from the internet, still makes shivers run down my spine. I feel very lucky to be able to call this amazing landmark part of my home town. 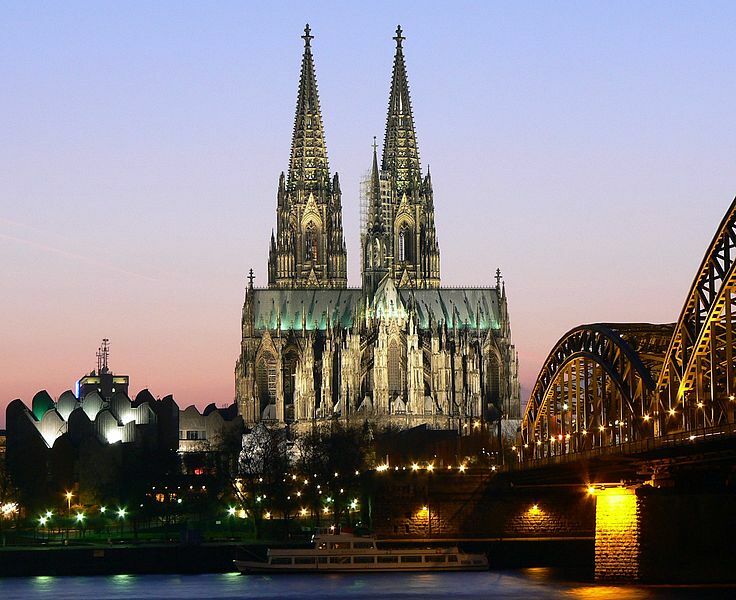 If you’d like to find out more, here’s a very interesting site showing the different stones and their sources, The Cologne Cathedral – A Geological Point of View. And a more detailed historical description by The UNESCO World Heritage List. What a spectacular view of a spectacular city! Due to its location Cologne has been at the centre of activities, cultural, economic and political, since its humble beginnings in 38BC. During roman times the city grew to be one of the most important trade and production centres in the Roman Empire north of the Alps. In the Middle Ages, 5th to 15th century, and up to the 18th century, religious and political issues shaped the city and its societies. As a free city Cologne was a sovereign state within the Holy Roman Empire and as such had the right (and obligation) to maintain its own military force. Wearing a red uniform these troops were known as the Rote Funken (red sparks). These soldiers were part of the Army of the Holy Roman Empire (“Reichskontingent”) and fought in the wars of the 17th and 18th century, including the wars against revolutionary France, when the small force was almost completely wiped out in combat. 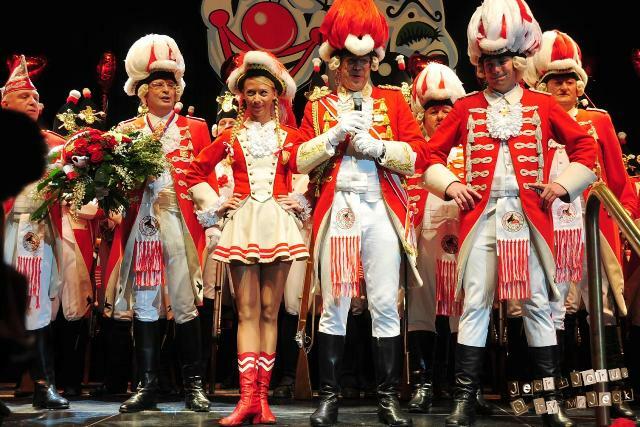 The tradition of these troops is preserved as a military persiflage by Cologne’s most outstanding carnival society, the Rote Funken. And every little girl wishes for nothing more than to be able to join the Garde and walk in the parades at Karnival time. In the 19th century Cologne lost its status as free city during the French occupation. After the treaty of Luneville (1801) all territories of the Holy Roman Empire on the left bank of the Rhine were officially taken over by the French Republic. This resulted in the Napoleonic Code being incorporated into public life, thus modernizing it and removing the old ruling elites. It remained active until it was replaced by the unified civil code (Bürgerliches Gesetzbuch) in 1900. But the long tradition of a free imperial city, which was long dominated exclusively by a Catholic population and the age-old conflict between the church and the bourgeoisie (and within it between the patricians and craftsmen), has created its own political climate in Cologne. Various interest groups often form the basis of societal socialization and therefore go beyond party boundaries. The resulting network of relationships, the political, economic and cultural links with each other in a system of mutual favours, obligations and dependencies, is also called Cologne coterie. As this blog is no means for conveying the complete history of Cologne, pop over to Wiki for more! We are looking forward to exploring this fascinating city with you on our Rhine and Romans Tour. One of the most imposing structures we visit on our Rhine and Romans Tour is the Ehrenbreitstein Fortress in Koblenz. It’s first mentioned around 1000 AD, a castle erected by someone called Ehrenbert. But already in 1020 the castle was transferred into the hands of the Archbishop of Trier. Since then it had been mainly in the hands of religious groups, who fortified and extended the castle to support and protect themselves in that area. As the alliances changed, the fortifications grew, thus increasing the importance of that particular building. This didn’t change and right through WW1 to WW2 it was seen as a strategic point to hold and keep. For more detailed data I can recommend this article. The castle now houses a restaurant, museum, the archives and a youth hostel. We enjoy the fantastic view over Koblenz and the confluence of the Rhine and Moselle from here on our Rhine and Romans Tour. 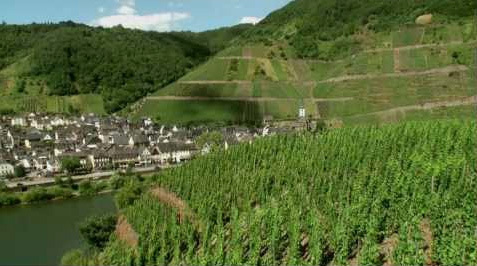 The wine route along the Moselle (in German ‘Mosel’) river will take us through parts of one of the 13 prime wine producing regions in Germany on our Rhine and Romans Tour. Until 2007 the name for the region included two other river, Saar and Ruwer, but to make it a bit more consumer friendly it got shortened to just Mosel. It is the third largest producing region in Germany and the leading one in terms of international prestige! This particular region is noted for its light bodied and crisp white wines. 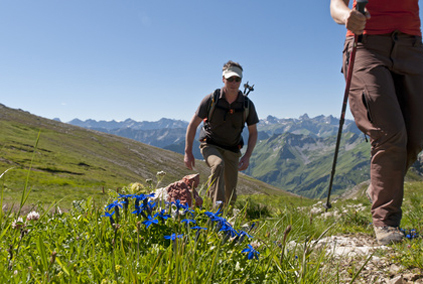 The ground in most vineyards has hardly any top soil and the gradient on the slopes is among the worlds’ steepest. An amazing description and photos of the famous Bremmer Calmont vineyard can be found at Crush. As the climate is northerly continental it hardly gets too hot, which has a huge impact on the ripening of the grapes and thus the sugar and acidity level in the wines. It is thought that the Romans brought grape vines with them, as they considered the transport of wine to supply their garrisons up north too costly and dangerous. First they considered digging a canal to connect the French wine region along the Saone with the Rhine, but then reconsidered and started planting grape vines around the hillsides of their first major outpost, Trier. By the 4th century viticulture was flourishing enough to be noted by Ausonius in a poem, writing about the beauty of the landscape at harvest time. According to an old legend, Merovech, king of the Salian Franks in 5th century AD, deported 12 thousand people from the Moselle region to his native Frankish region, the lower Rhine area, and in turn sent 12 thousand of his fellow franks to the Moselle region. These eastern franks were keen wine growers and took grape vines with them and planted them along the Moselle. Folklore still calls “Frankenwein, Krankenwein”, meaning that the wine made by Franks is good for healing the sick. And the same apparently applies to its successor, the Moselwein: “Vinum Mosellanum fuit omni tempore sanum” – Moselle wine is healthy at all times.